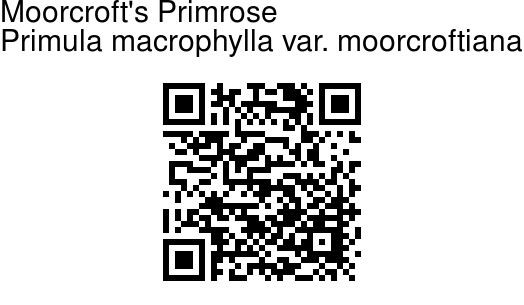 Moorcroft's Primrose is a distinct variety of Primula macrophylla, characterized by flowers with two-lobed petals. 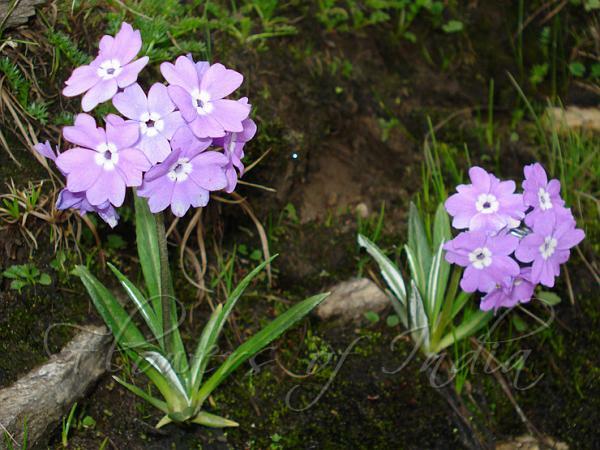 Petals are entire in Primula macrophylla. Flowers are pink, violet or lilac, with usually a lighter center. Petals are inverted-heart-shaped, 5-7 x 5-6 mm. Sepal cup is cylindrical with linear-lanceshaped sepals. Flowering stems are 12-25 cm tall. Leaves are erect, 10-30 cm long, entire or toothed, white powdery beneath, gradually tapering to a long sheathing leaf-stalk. Capsule is cylindric, up to 2.5 cm. Moorcroft's Primrose is found in the Hiamalyas, from Afghanistan to SE Tibet, at altitudes of 3300-4800 m. Flowering: June-August.